Twenty-one dead dolphins have been washed up along the coast of Cornwall over the past four days. Environmental groups believe most of the mammals were killed after getting entangled in fishing nets. A post-mortem examination will be carried out on three of the carcasses on Monday. Joana Doyle, the marine conservation officer for Cornwall Wildlife Trust, said an outright ban on harmful fishing methods was needed. The trust operates a 24-hour telephone hotline for people to report strandings. Co-ordinator Maddi Precious said it had been an exceptionally busy period. "Distressed members of the public keep calling to tell us of yet more bodies," she said. "It's been hard to keep up, but luckily we have over 120 people trained to do the work." In September 2004, the government introduced a ban on pair trawling within 12 miles (19km) of UK waters. The fishing method, which involves a large net being attached to two boats and trawled through the water, has been widely blamed for the high number of dolphin and porpoise deaths along the region's coast. But environmental groups claim dolphins are still being caught and the ban has resulted in some fishermen moving to deeper waters. Ms Doyle said. "It is apparent the ban on pair trawlers fishing within the 12-mile shore limit is not working. "As we said, dolphins feeding outside the area are just as likely to be caught, as they don't know where the limit is." 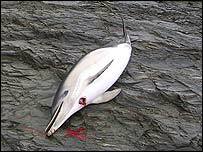 Ms Doyle said inshore gillnet fishing could also be responsible for some of the recent cetacean deaths. "Most of those killed over the past few days were found around St Austell Bay, where there is an inshore gillnet fishery," she said. Anyone finding a dead dolphin is asked to contact the trust's strandings hotline on 08452 012626. Ms Doyle said work must continue to stop the deaths. "If we don't, Cornwall could eventually lose part of its wonderful wildlife heritage and we'll be all the poorer for it."